GRAPHIC CONCRETE TRANSFORMS ONE OF THE OLDEST BUILDING MATERIALS FROM TRADITIONAL TO TRENDY. The technique is simple and ingenious. Anything you can print on a paper you can place on any precast concrete surface. Create something stunning. Tell a story. ONLY YOUR IMAGINATION SETS THE LIMITS. Graphic Concrete technology allows you to impart durable patterns and images onto any precast concrete surface. Graphic Concrete® offers an easy way to produce a patterned concrete surface, giving the surface interesting dimensions, even 3D effects, depending on the viewing distance. The patented technology involves applying a surface retarder to a special membrane that is used in the precast process. It allows you to impart patterns or images onto any kind of precast concrete surface. The result is 100% concrete, and is as durable and maintenance-free as concrete itself. The Graphic Concrete technology enables cost-effective and high-quality production of patterned concrete. It reduces the need for additional scaffolding, minimizes disruption of the construction site and saves time during construction. The outcome is 100% made of concrete and as durable as the concrete itself. A Graphic Concrete surface is virtually maintenance free, which saves costs during the whole lifespan of the building. First, the chosen image or pattern is imprinted on a special retarder membrane. An appropriate concrete mix design is determined. The membrane is placed on the bottom of a form and concrete is cast atop it. After the panel cures, it is stripped from the mold and the membrane is removed. The retarder and unset cement is washed away with water, revealing the final image. The Graphic Concrete membrane is recyclable and safe to use. It contains no harmful substances and reduces the use of solvent based materials and dust inconvenience during precast production. This environmentally friendly technology combines precast concrete’s durability with aesthetic versatility. Whatever your role is in the construction chain, we will make sure that your special needs are taken care of. We offer training for precast concrete producers and free project consultation for architects and designers. Our design service can take care of your custom pattern or image design. Our preferred customers, developers and investors have access to a price tool. Organizing an event? We can provide you with an expert speaker on architectural concrete. If you represent the media/press we will be happy to give you access to our vast image bank. Whatever you need, we are here for you! We help new precast producers get started, provide test membranes and offer casting advice. In order to ensure top quality, we will make sure all Graphic Concrete producers get proper training. Free consultation with architects and designers throughout the design process. You can order unique images or patterns from our Design Service. 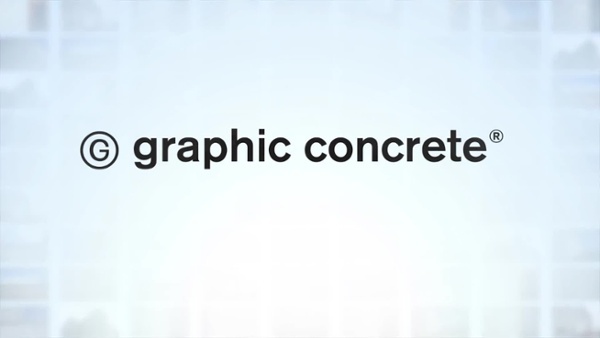 Together, we will make sure your Graphic Concrete project is a success! We provide pricing information on the Graphic Concrete membrane only. The final price for the concrete product is always given by the local concrete producer. As a partner or preferred customer you will have access to our membrane pricing tool. We offer speakers to trade shows and events and provide lectures for students of architecture and concrete construction. If you need high resolution photos of a Graphic Concrete project we will be happy to provide you with images. Choose from hundreds of stunning projects. Our GCCollection patterns are ready made patterns that are easy to use. They can be modified (scaled, turned, details added) for no extra charge. You can also use them just as inspiration, since there is no limit to what your final pattern can look like. What is beautiful, ugly, right or wrong?